During the long, cold dark days of winter, my family leans on sturdy roots, sweet butternut squash, and hearty soups and stews, so by the time the snows recede and the green shoots and buds of spring begin to emerge in the warming light, we’re ready for something decidedly lighter, fresher and brighter. This is the time that I begin to lean more heavily on salads, huge salads dotted with young carrots, thinly sliced radishes, fresh peas and any other spring vegetables I come across at the market. Herbs, too, make nice additions to salads, serving as a nice contrast to crunchy leaves of lettuce. Herbs pack powerful medicine. Like all leafy greens, they’re rich in minerals, beta carotene, and folate. They’re also rich in antioxidants, and various organic compounds that given them their perfumed aroma and assertive flavor. Rosemary Gladstar’s book, Herbal Recipes for Vibrant Health, is one of my favorite resources for accessible, practical recipes for using and understanding both the culinary and medicinal use of common (and some uncommon) herbs and spices. When herbs grow in abundance, typically in the spring and summer in our area, I use them liberally – dropping them into salads, making heady herbal tisanes and sun teas, sprinkling roasts and braised vegetables with them. In this salad, I used what I kept handy: chives, mint, flat-leaf parsley and feathery chervil. Thick creamy dressings stand up well to another springtime favorite: Buttercrunch lettuce, with its big, tender leaves. Vinaigrettes seem to fall flat with this type of lettuce, dripping off into the bottom of the salad bowl rather than lightly coating the leaves like a good creamy dressing does. Most creamy dressings rely on an emulsion of eggs and oil, much like mayonnaise, to achieve their thickness, but this dressing – always a favorite for its ability to come together in an instant of whisking – achieves its thickness from creme fraiche, whisked with a bit of oil and lemon juice and zest. Like yogurt, creme fraiche is a cultured dairy product that you can make in your own kitchen with a bit of cream and starter culture. You can purchase a starter culture here, or do what most chefs do and simply whisk a bit of buttermilk into cream, cover it, and leave it until thickened, about a day or so. I love to add something a little crispy, and a little salty to salads, as well as something that makes salads a touch more substantial and satisfying like walnuts added to roasted beet salad or pecans added to this autumn salad. Prosciutto, crisped in a hot cast iron skillet, provides a lovely complement for the bright flavors of fresh herbs and sweet peas. Delicate Buttercrunch lettuce pairs beautifully with creamy dressings like this one made of creme fraiche, herbs and lemon. Other hallmarks of spring, fresh herbs, green peas, radishes and edible flowers add color while crispy prosciutto provides salty notes and a bit of crunch. 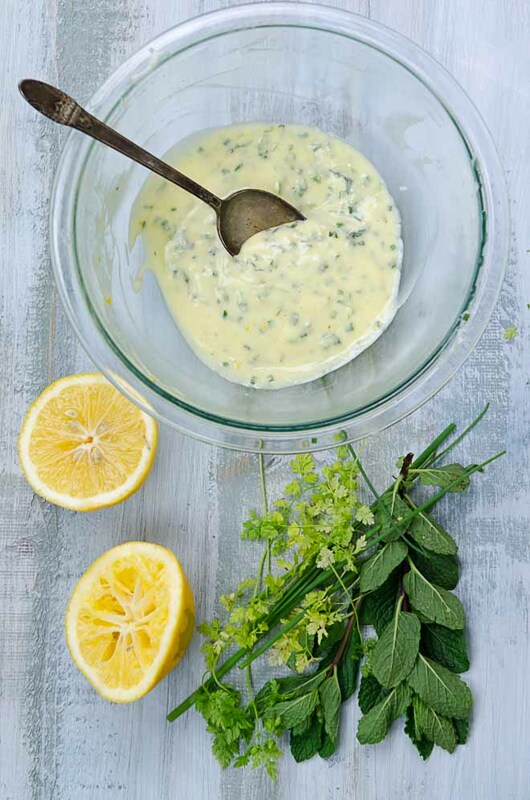 Spoon the creme fraiche into a mixing bowl, whisk in the olive oil, chives, mint and chervil. Grate the lemon peel very finely into the bowl with the creme fraiche. Cut the lemon cross-wise, and then squeeze its juice into a bowl or small pitcher. Strain the juice to remove the pulp and pips, and pour the juice into a mixing bowl. Whisk the lemon juice, salt and white pepper into the dressing, and set it aside until you're ready to dress the salad. Heat a cast iron skillet over high heat. When pre-heated, drop in the prosciutto, and cook it until crisped. Set it on a plate to cool while you prepare the other ingredients. Toss the vegetables, flowers and herbs together. Toss in the crisped prosciutto, and dress with the creme fraiche dressing at the table. Never heard of Buttercrunch before. I’ll have to see if my local farmers market has this yet. Wow this looks absolutely gorgeous!! 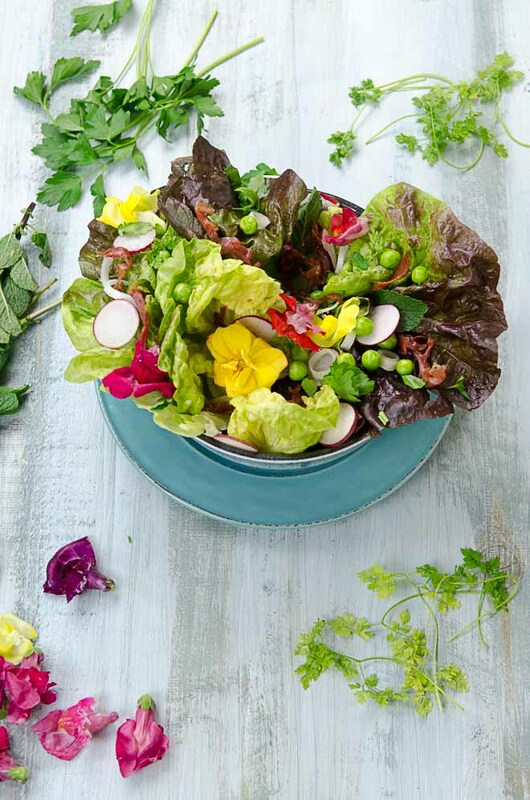 Love the flowers in the salad- I’ve never tried that before. The combo of all the vegetables looks great! Absolutely beautiful. I love adding flowers to my spring salads. The last ingredient–one head of what? That’s the most beautiful salad I have ever seen. It’s a smile on a plate! 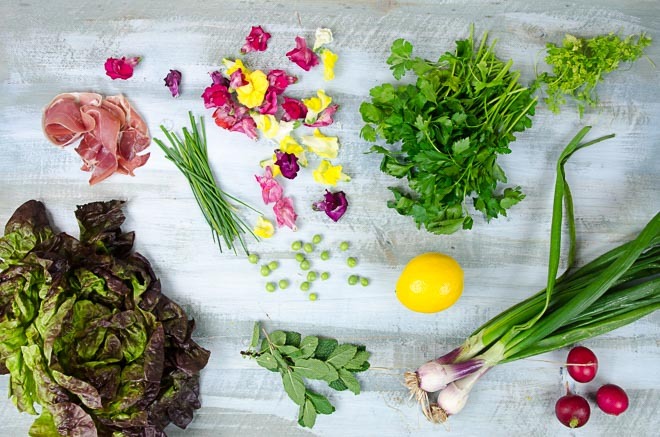 The springtime salad looks for beautiful. Love the crispy prosciutto idea. I know what I am making tonight.